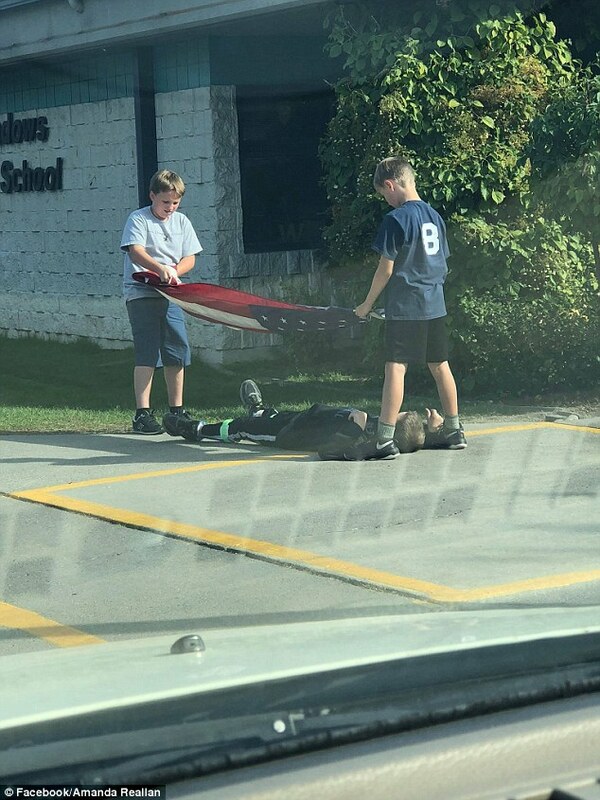 A photo of three Idaho schoolboys going above and beyond to prevent the USA flag from touching the ground is going viral after one of the boys laid on the ground to protect it. 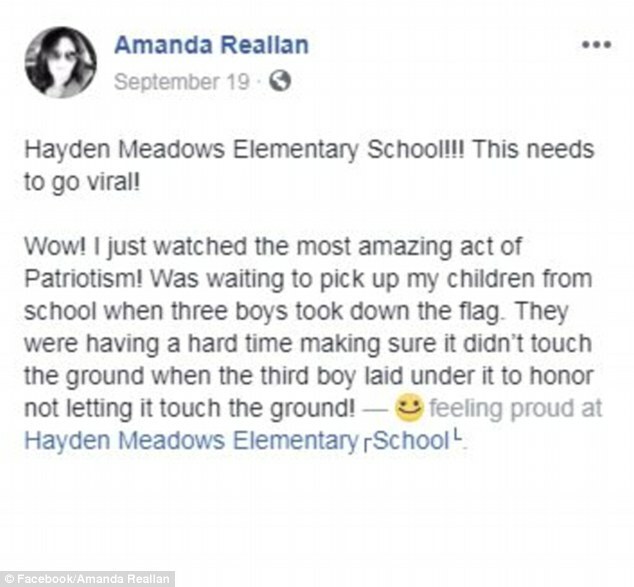 A mother collecting her children from school captured the moment on camera after she spotted the fifth grade youngsters taking down the flag on a windy day and strictly adhering to etiquette. 'Hayden Meadows Elementary School!!! This needs to go viral!,' Amanda Reallan captioned her Facebook image. 'Wow! I just watched the most amazing act of Patriotism! Was waiting to pick up my children from school when three boys took down the flag. The post has been shared more than 7,000 times with comments saying they are 'Future law men' and 'I'm so PROUD of these boys!!!'. As experienced Cub Scouts the trio of boys knew exactly how to handle the tricky weather conditions in order to adhere to flag rules. US Flag Code states that the stars and stripes 'should never touch anything beneath it, such as the ground, the floor, water, or merchandise'. Additionally, 'the flag should never be carried flat or horizontally, but always aloft and free'. Jack LeBreck had the bright idea but thanked Mac McCarty, a veteran who served for 20 years, for inspiring them to be good countrymen. 'It was all because of our custodian, Mr. Mac,' LeBreck told KSDK. Casey Dolan was just happy to be one of the boys selected to take down the flag that day. 'It's really a great privilege. I feel really lucky I was chosen for it,' he added. Another helper was thrilled with the unexpected attention they're receiving and it's making him consider a full-time career in the spotlight. But their custodian is not accepting credit for the patriotic act and puts the viral image down to their own thinking.